Guo, Tinghao Xu, Jiarui Sun, Yue Dong, Yilin Davis, Neal and Allison, James T. 2018. Network Analysis of Design Automation Literature. Journal of Mechanical Design, Vol. 140, Issue. 10, p. 101403. Salembier, Chloé Segrestin, Blanche Berthet, Elsa Weil, Benoît and Meynard, Jean-Marc 2018. Genealogy of design reasoning in agronomy: Lessons for supporting the design of agricultural systems. Agricultural Systems, Vol. 164, Issue. , p. 277. Zhang, Qian Hao, Jia Xue, Qing and Yan, Yu 2018. Human-Computer Interaction. Theories, Methods, and Human Issues. Vol. 10901, Issue. , p. 371. Lamé, Guillaume Yannou, Bernard and Cluzel, François 2018. Usage-driven problem design for radical innovation in healthcare. BMJ Innovations, Vol. 4, Issue. 1, p. 15. Prost, Lorène Reau, Raymond Paravano, Laurette Cerf, Marianne and Jeuffroy, Marie-Hélène 2018. Designing agricultural systems from invention to implementation: the contribution of agronomy. Lessons from a case study. Agricultural Systems, Vol. 164, Issue. , p. 122. Iivari, Juhani 2017. Information system artefact or information system application: that is the question. Information Systems Journal, Vol. 27, Issue. 6, p. 753. Kohsaka, Ryo Fujihira, Yoshinori Uchiyama, Yuta Kajima, Shuichiro Nomura, Shuhei and Ebinger, Frank 2017. Public Perception and Expectations of Biomimetics Technology: Empirical Survey of Museum Visitors in Japan. Curator: The Museum Journal, Vol. 60, Issue. 4, p. 427. Fu, Katherine K. Yang, Maria C. and Wood, Kristin L. 2016. 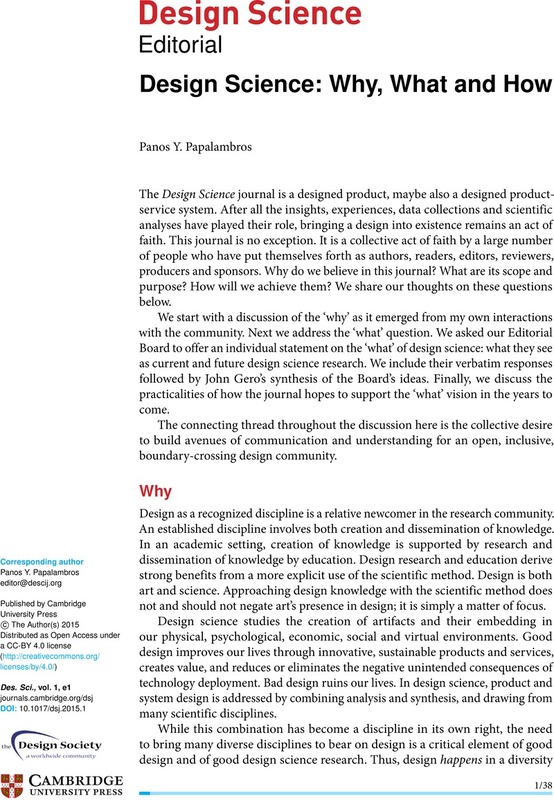 Design Principles: Literature Review, Analysis, and Future Directions. Journal of Mechanical Design, Vol. 138, Issue. 10, p. 101103. Allison, Scott T. 2016. Global Encyclopedia of Public Administration, Public Policy, and Governance. p. 1.